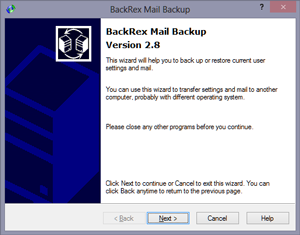 BackRex Mail Backup is an email messages and mail program settings backup tool, allowing you to backup email, settings and customizations from your favorite mail reader. You can restore saved email and settings later or transfer them to another machine or the same machine under another OS environment. Windows Mail, Outlook, Outlook Express, Eudora, The Bat!, IncrediMail, Mozilla Thunderbird mail clients are supported. BackRex Mail Backup also saves current configuration of your mail client, such as blocked senders list, mail filters, redirection rules, and others. As a bonus, Internet Explorer, Firefox, Opera browser customizations, including favorites. Security settings and dial-up preferences are also saved. Mail Backup can help you to migrate all your mail and settings from one computer to another, even if different version of Windows is installed on another machine (e.g. Windows XP and Windows Vista systems). BackRex Mail Backup has a command-line interface. You can use it to start backup and/or restore process unattended from any script or batch file. How to use BackRex Mail Backup? 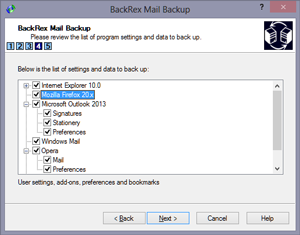 Run BackRex Mail Backup on the computer which mail and settings of mail clients you want to save, then choose Backup option in the program, select a folder to save all collected data in, and finally specify mail programs settings and data you would like to back up. After BackRex Mail Backup finishes processing data, keep the results in a safe place – you will need them to restore your data and settings. To restore your data, start BackRex Mail Backup, select a folder, created during the backup process, and all your e-mail and mail program settings will be restored within several minutes. Just reboot your computer to complete the restore process. Easy, isn’t it? Mozilla, Eudora, The Bat!, IncrediMail, Outlook and Outlook Express are supported. Migrating between different versions of Windows. Does not restore Eudora, IncrediMail and The Bat! settings and data. Does not restore Microsoft Outlook Signatures and Stationery. BackRex Mail Backup can be ordered worldwide. Click here to order now. For immediate delivery choose online order option. You will receive download instructions in just a few minutes after placing an online order, 24 hours a day, 7 days a week.